Your grandchild is beautiful. The editing gives the photo the look of a painting. I believe grandchildren to be the icing on the cake of life. 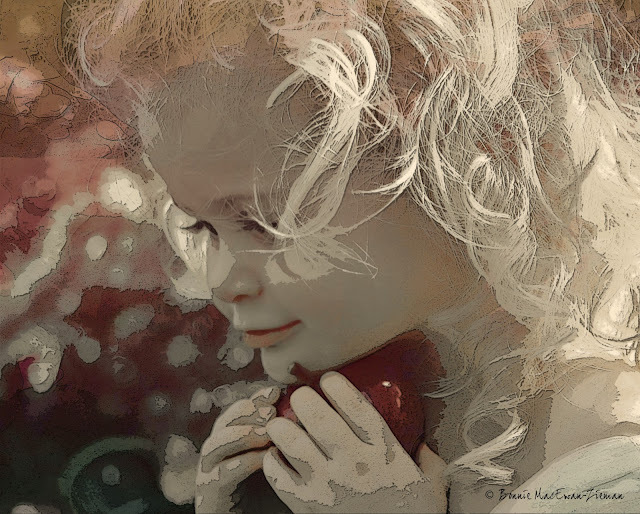 Beautiful little girl....I love the effect as well. A vintage look for her is lovely! I am a grandmother, too, and would like to do this but have no space on my hard drive for photoshop elements. Lovin' those eyelashes! This one is a keeper. What a wonderful enhanced portrait! A beautiful little gal. Oh Grizz - you do have a way with words! However, you have to look around - grandmothers these days do not fit the sweet, little old lady stereotypes. Many vital, young middle-aged women are grandmothers. While I am not exactly middle aged any more, I did marry at nineteen (eeeeeek!!) and therefore all the joys of the reproductive cycle got off to an early start! She's beautiful, Bonnie! I really like the editing you did on this one. Great work! Bonnie, this is truly so beautiful! Wow... this is fun.. I am definitively going on version2 .. I love that kind of art..
(hm can't write the link in the comment as: so I put the link here?